Direct use: We’ve welcomed 50 million unique individuals directly to the site since 2003. Web metrics always come with caveats, and I could interpret the stats 10% higher or 10% lower, but this is a good round number. Translation site visits: Our translation affiliates maintain their own sites, and some are better than others about reporting traffic, but we’ve had 32 million visits reported from them. Divide this by the 1.8 visits per visitor historic ratio we have and you get just under 18 million visits. 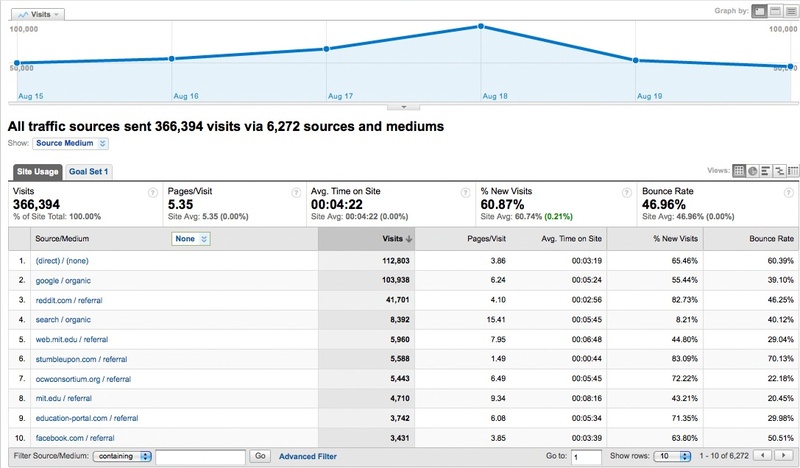 This doesn’t reflect significant numbers of unreported visits, so let’s round up to 20 million. Redistribution sites and programs: Since we began redistributing our content through iTunes U and YouTube, we’ve received reporting indicating 17 million downloads from iTunes U and 15 million YouTube views. The ratio of views/downloads per visitor is going to be higher than the visits/visitor above (plus there is overlap with some folks watching embedded YouTube videos on our site) so let’s say 2.5 views/downloads per visitor. This would mean roughly 13 million more. We are redistributed by a number of other sites (AcademicEarth, Videolectures.net) and we have sent mirror sites to 250 universities in bandwidth-constrained regions, so lets add another 2 million for this. This brings our running total to 85 million. Secondary uses: OCW materials are licensed for reuse, and we actively encourage visitors, especially educators, to download and reuse the materials. We know that many educators do, and are thus bringing OCW materials to large numbers of students who never visit our site. It’s a bit of a finger in the wind to figure out how many people this might represent, but let’s take a stab. Educators are 10% of our visitors historically, so 5 million educators. Forty-six percent of faculty responding to surveys indicate they have reused OCW materials. This is almost certainly an overcount, as the survey respondents are self selected, but how many would have to have reused OCW content to have shared it with 15 million students? Assuming each teacher might share the materials with 50 students (a conservative number I hope), that would mean that 300,000 educators would have had to reuse OCW materials in the past ten years. That’s 6% of the educators that our metrics indicate have been to the site. This seems reasonable, if not conservative. Fifty million direct, 20 million to translations, 15 million to redistribution sites, and 15 million through secondary use = 100 million. All of these numbers are squishy and there’s some overlap between them. Maybe it’s in the 80 million range; maybe it’s higher than 100 million. Even in rough numbers, it’s truly humbling to roll it all up this way, and a testament to the generosity and vision of the MIT faculty. MIT OpenCourseWare: What the world is learning. In my undergraduate days, I used to go to the West Virginia University Library and (quite illegally) copy large sections of books in the collection, feeding dime after dime into the photocopier to pay the 10 cents a page. And that’s back when a dime was a dime. I realized today in looking at some of the OCW statistics that our project has become more cost effective than that older method of redistributing educational materials. We’ve topped 540 million page views since launch on a total investment of 40 million dollars (both round numbers). That comes out to under 8 cents a page (and that’s just our HTML content—even more cost effective if we counted the PDFs that hold most of the content).